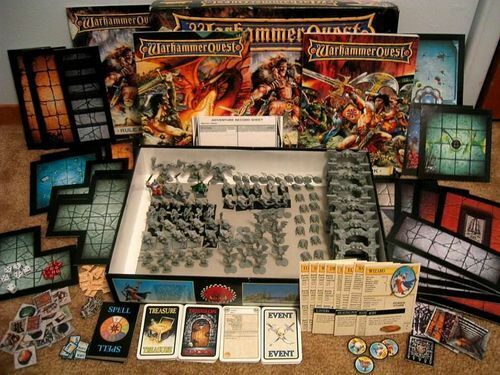 Some of us will be of an age where we can remember the tabletop Warhammer Quest game. I remember one of my friends managing to pick up a copy when we were really into 40k and scoffing at the notion it could be fun. Many epic dungeon crawls later and it still ranks as one of my favourite tabletop experiences, The best way to start this review is with these simple words. The iOS version really lives up to the tabletop version. First things first, I have only played this on iPad, I assume the functionality would carry over to the iPhone however. Controls are kept simple, everything is done with a few taps, tap to select, tap for action. Inventory access is done by turning the device to portrait view, which brings up your inventory screen, a nice touch. Reverting to the game by simply turning the device back to landscape. Gameplay wise, you start off in a map screen with various towns serving as your quest hubs. There are 'storyline quests' for each of the towns and random quests available every time you return to them as well. A simple tap on any of the quests tells you the recommended level and the item/loot awaiting you if you complete the dungeon. 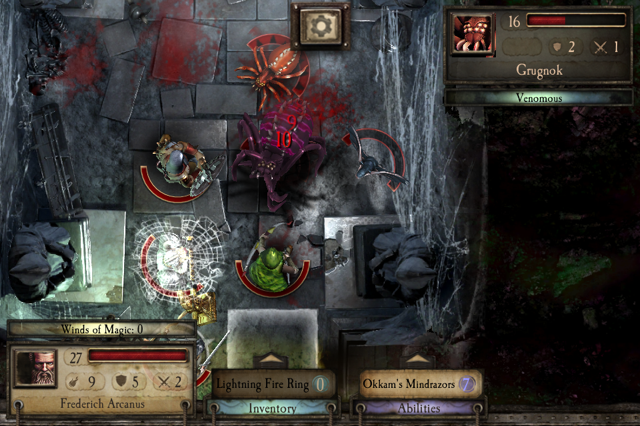 Once in dungeons you begin with a party of 4 characters (3 others available to purchase as DLC) who start out weak as befitting any would be adventure/rpg game, the first dungeon serves as a tutorial, really easing you into the game and taking you step by step through the mechanics, a welcome idea. Then the training wheels are off and it leaves you to your own devices. The combat is tactical and very fun, there are only few animations but overall the experience is excellent and manages to balance nostalgia and hack n slash dungeon gameplay. There is loads of loot to find and building up your characters to complement each other gives a real sense of achievement. Random events are intact and make every dungeon different. The only way the interface could improve for this geek is a visible simulated dice roll for any rolls needed, but that is a tiny personal preference. As seems to be the standard with apps now, there are In-App purchases, one being an expansion containing more towns and the deplorable Skaven as enemies. Also 3 extra characters, which cost nearly as much as the original game itself. The game is not without the odd problem, I have crashed out a half dozen times in the many hours I have played it, seems to only happen on random mob spawns, this is not terrible as it autosaves every turn, but still, an annoyance. Also the sound sometimes bugs out and mutes itself, this has only happened twice however. Speaking of random mob spawns, for lower level characters multiple random event spawns in a row can quickly overwhelm the party, again this is random but can be frustrating. Easy to pick up controls/interface. Combat is simple, but tactical. Loads of loot items to find. Overall I am very impressed with this game and can see myself plugging many more hours into it. I suppose every review needs a score rather than a sense that the game is just remarkably fun, despite the occasional bug/unfair spawn.